Belgian riot police clashed Sunday with hundreds of right-wing hooligans at a temporary shrine honoring victims of the Brussels suicide bombings. BRUSSELS -- Belgian riot police clashed Sunday with hundreds of right-wing hooligans at a temporary shrine honoring victims of the Brussels suicide bombings, as investigators launched fresh anti-terror raids, taking four more people into custody. Explosions rocked the Brussels airport and the subway system Tuesday, just days after the main suspect in the November Paris attacks was arrested in the city, police said. Belgian investigators have been slammed for not questioning Abdeslam long enough or hard enough after he was shot in the leg during his arrest. 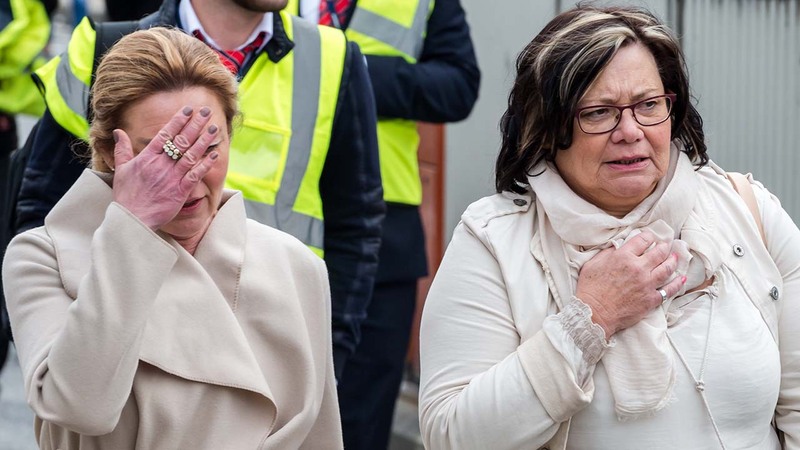 Police have also been criticized for taking too long to get to Zaventem airport on Tuesday morning after two suicide bombers blew themselves up there - and left an even bigger third suitcase full of explosives that did not go off. Turkey has said that Bakraoui - whose brother Khalid was the suicide bomber at the Maelbeek subway station on Tuesday - was caught near Turkey's border with Syria in 2015 and Ankara had warned Brussels and the Netherlands that he was "a foreign terrorist fighter." Belgian authorities said they did not know he was suspected of terror-related activities until after he was deported to the Netherlands. On Sunday, Italian police in the southern city of Salerno said they had arrested an Algerian wanted in Belgium for an alleged false ID crime ring. Djamal Eddine Ouali was arrested Saturday in the town of Bellizzi, said Luigi Amato, the head of Salerno police's anti-terrorism squad. Ouali, 40, was being held in jail while authorities expect extradition procedures to soon begin. Meanwhile, Dutch prosecutors say police have arrested a 32-year-old Frenchman in the port city of Rotterdam at the request of French authorities who suspect him of "involvement in planning a terror attack." Prosecutors said in a statement Sunday that French officials requested the arrest Friday after the suspect emerged during an investigation. The suspect, whose identity was not released, is expected to be extradited to France soon. Click here for full coverage on the deadly bombings in Brussels.